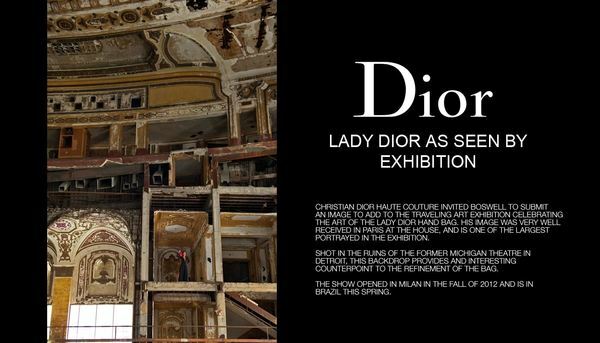 BOSWELL WAS ASKED TO SUBMIT AN IMAGE TO ADD TO THE TRAVELING ART EXHIBITION CELEBRATING THE ART OF THE LADY DIOR BAG. HIS IMAGE WAS VERY WELL RECEIVED IN PARIS AT THE HOUSE AND IS ONE OF THE LARGEST PORTRAYED. THE SHOW OPENED IN MILAN IN THE FALL OF 2012 AND IS IN BRAZIL THIS SPRING.